Biotique Men Care - Worldwide Shipping. Mold and Accentuate your Hair Style. 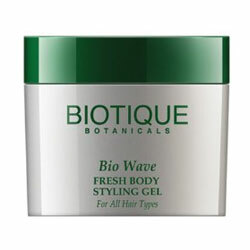 This alcohol-free styling gel is a blend of seaweed, musk root and centella extracts to mold and accentuate your hair style. Like waves from the ocean, mineral salts give hair a sleek, buoyant, wet look that holds its shape for hours. Ocean is where life began, a rejuvenating Eden of mega-vitamins, amino acids, minerals and other nutrients with extraordinary healing powers. Apply sparingly to damp or dry hair. Comb through and style. Let hair dry naturally or with heat. Restyle by dampening hair.